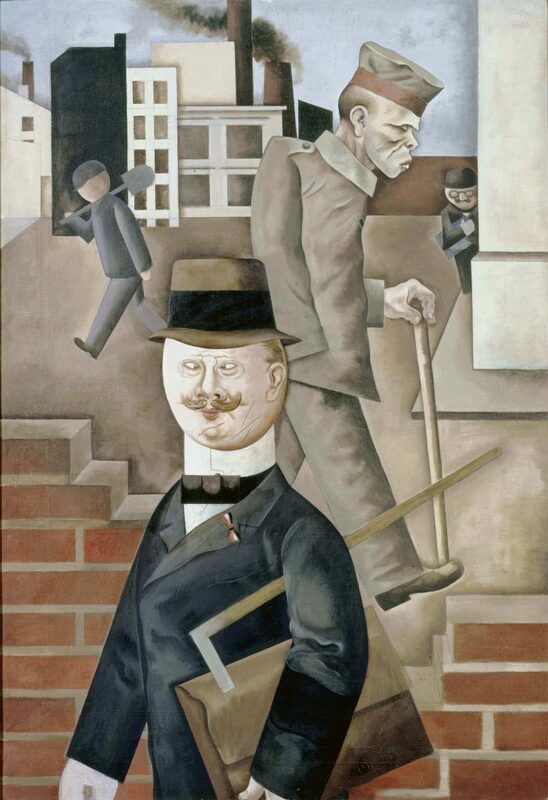 George Grosz, Grey Day (1921). Image: Staatliche Museen zu Berlin, Nationalgalerie. Acquired by the Federal State of Berlin. © Estate of George Grosz, Princeton, N.J. 2018. Minus the taxes, this is a good sketch of the populist subject matter explored by George Grosz, the German Dadaist, communist, and First World War veteran, whose pictures satirised the injustices of the Weimar Republic. Grosz’s painting Grey Day (1921) is the central piece in Tate Britain’s wonderful ‘Aftermath: Art in the Wake of World War One’ exhibition, which closes on September 24th. This vast show would be worth catching for Otto Dix’s war etchings alone, but also boasts some excellent pieces by CRW Nevinson, Max Ernst, William Orpen, and Max Beckmann. Grey Day contrasts a gloomy industrial worker and an amputee war veteran with a “bourgeois” German in a suit, who happily trots along, oblivious to their plight. The latter figure is something of a caricature, but then, so are the worker and the soldier. This tendency to deal in stereotype crops up in Grosz’s other pieces in ‘Aftermath’, such as 1921’s Toads of Property and his collection The Face of the Ruling Class, and reveals the essential distortion of reality Grosz’s communist politics force on his art. This is less a criticism of his art than of his politics. After all, the great works of Christian art are no less beautiful for their political message, nor for their distance from reality. The question of whether Grosz’s pictures are works of art is settled at a single glance. But the underlying political assumption in Grosz’s work, which is that 1920s Germany was so debased only communism could save it, was wrong twice: first about Germany, which could and did plumb lower depths, and second about communism, which in the end couldn’t even save itself. From today’s vantage point – after Nazism, World War Two, the Holocaust, and east German communism – the Weimar Republic doesn’t look so terrible, (even if it still looks like it might have been doomed from the start). Given this, it might be worth asking: Were German artists like Grosz wrong to radically attack the Weimar Republic when the alternatives were so dangerous? First, it’s important not to overstate art’s influence on politics. The comedian Peter Cook, making light of art’s political impact, once remarked that “those wonderful Berlin cabarets” didn’t stop the rise of Hitler. That’s true, and moreover, the rise of Hitler put a stop to those Berlin cabarets. The Nazis also confiscated modernist paintings, including George Grosz’s Metropolis (1916) and several of his drawings, and mocked them at the infamous “Degenerate Art” exhibition in 1937 hosted by The Führer, (himself a failed painter). Grosz had been fined for his work in the 20s under the pre-Nazi governments, but it wasn’t until he was threatened by some local Brownshirts in 1932 that he decided to leave the country for America. It’s a commonplace to say that a society where people can express themselves freely, and criticise anything they like through art or other means, is better than one where you can’t. It’s therefore tempting to suggest that those German artists should have recognised their relative freedom and kept their criticisms constructive. But what good is free expression if you don’t use it? To not use it out of fear you’ll lose it is effectively to not have it. I’ve said that Grosz’s political views don’t spoil one’s appreciation for his pictures. But his politics did prevent him from making better ones. Contra Camus, Grosz had a commissar in his head, and it stopped him from developing as an artist. His friend Otto Dix had a brief flirtation with communist politics and Dada forms, including his own brilliant pictures of amputee veterans, (also in ‘Aftermath’ — War Cripples, Card Players, and Match-Seller, all 1920). But Dix moved on, withdrew from politics, and focused on trying to paint the world objectively, rather than as his opinions dictated. Even in his Dada pictures, there’s no sense of hostility to any of the people in them. As Camus also says, the role of art is not to judge but to understand. The result is Dix’s rich body of work, full of colour and humanity. Grosz by contrast is over near the propaganda “chasm” of Camus’s formulation. Ironically, this makes his work less persuasive, whereas Dix’s commitment to honesty and even beauty produced the finest picture polemic against war since Goya. As Percy Bysshe Shelley said, art is most likely to affect the world when it isn’t trying to.